Jon Jones recently cleared his long ordeal with USADA for a failed drug test that nulled a UFC Light Heavyweight Title win back in July 2017 at UFC 214. The result sees Jones eligible to fight again on Oct. 28, just days before UFC 230. Jones’ comeback fight has not been booked yet, though a targeted bout would see him rematch with Alexander Gustafsson at UFC 232 on Dec. 29 in Las Vegas. But during an appearance on Submission Radio, Jones’ coach, Mike Winkeljohn, said Jones suffers from a fear of eating out at restaurants, fearing someone may spike his food, causing yet another failed test. 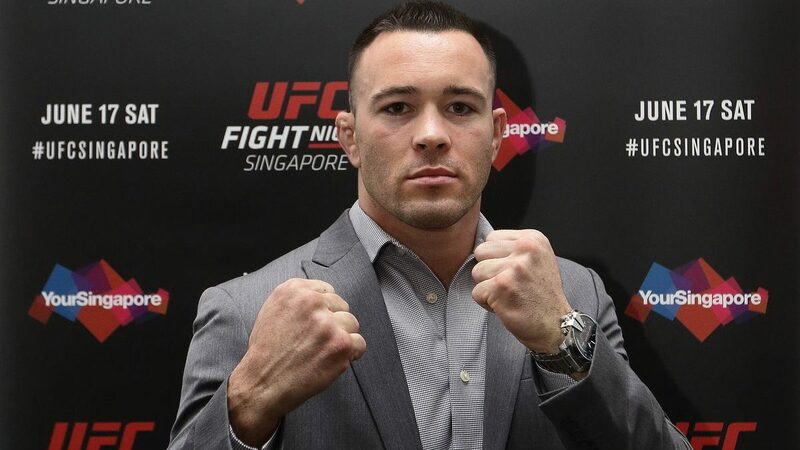 The statement caught the attention of another controversial, and an outspoken, UFC fighter in Colby Covington. Covington took to Twitter to mock Jones’ dining phobia. Yeah Jon. Applebee’s keeps steroids and cocaine on site to sprinkle in your soup de jour. You’re such a f***ing a**clown. 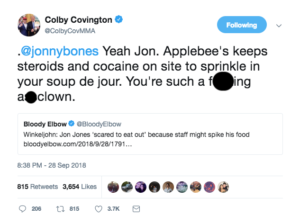 Covington is expected to challenge Tyron Woodley for the welterweight title in the future, but he may have a new social media rival in Jones — unless Jones chooses to ignore his comments.